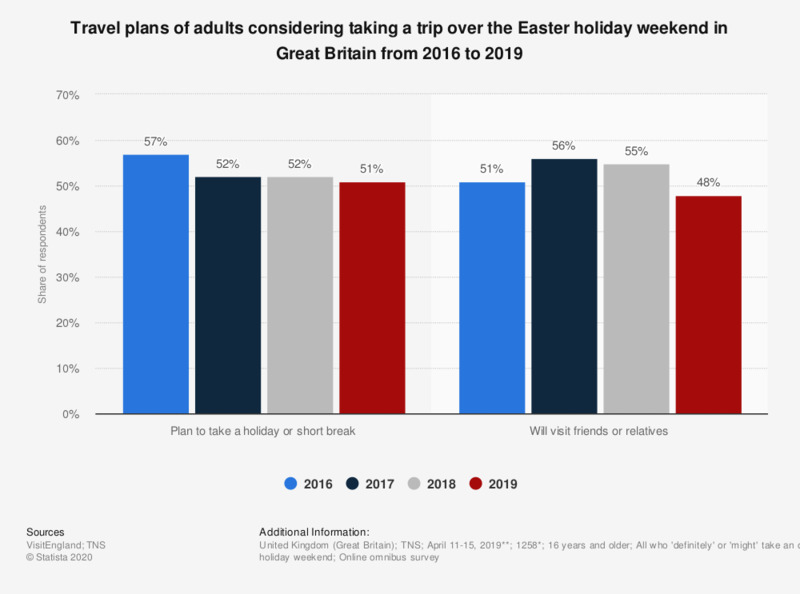 This statistic shows the travel plans of British adults over the Easter bank holiday weekends from 2016 to 2019. Of those stating that they might or definitely will take an overnight trip over Easter weekend, 51 percent said they planned to take a holiday or short break while 48 percent said they will visit family or friends. Many people wait before planning travel for various reasons, such as waiting to see what the weather will be like. * 2019 sample. 2018 n=1,228; 2017 n=1,239; 2016 n=1,230. ** 2018 survey dates = March 22-26, 2018; 2017 survey dates = April 6-10, 2017; 2016 survey dates = March 17-21, 2016.